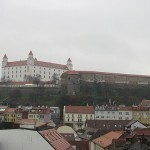 The Castle of Bratislava is the most famous attraction in all of Slovakia. It has a splendid location at a rocky hill 85 meters above the Danube. 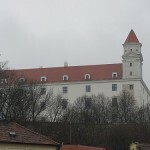 At first a stone castle was constructed at the hill in the 900s, and this was later transformed into a Gothic castle in the 15th century, later into a Renaissance castle in the 16th century and finally in the 17th century into a Baroque castle. In 1811 a crucial fire lay the Castle in ruins, and it remained in ruins until the 1950s. There are many interesting legends and several interesting buildings in the castle area, so it can be worth visiting this area with a tourist guide! 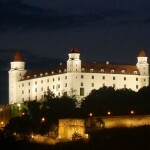 It is not a long walk to the Castle from the main square in the center of Bratislava, so there are no excuses for not visiting this exciting and interesting area. On cloudless days you can see all the way into Hungary and Austria from the Castle area.